Monday 27 November: NLI Reading Room & Manuscript Room closed. Venue: National Library of Ireland, Kildare St, Dublin 2. On-going Monday closures to facilitate redevelopment of the premises. All other services/exhibitons/cafe, incl. Genealogy Advisory Service operating as normal. Details. Monday 4 December to Friday 8 December: National Archives of Ireland's Reading Room closed to the public during the annual Media Preview week which allows journalists and broadcasters to preview government archives due for release in early 2018. Details. Reading Room will reopen on Monday 11 December. Monday 4 December: NLI Reading Room and Manuscript Room closed. Venue: National Library of Ireland, Kildare Street, Dublin 2. On-going Monday closures are to facilitate extensive redevelopment of the premises. All other services/exhibitons/cafe, including Genealogy Advisory Service operating as normal. Details. Monday 4 December: The Meltin' Pot Dive – a personal story of the discovery of the B17 Flying Fortress in the Foyle, with Danny Keenan. Host: North of Ireland Family History Society, Foyle branch. Venue: Lecture Room of Derry City’s Central Library, 35 Foyle Street, Londonderry, BT48 6AL. All welcome. Free. 7pm. Monday 4 December: Christmas Night – Historical superstitions, with Hugh Burns. 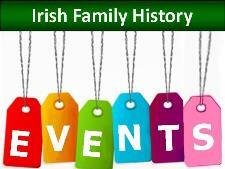 Host: North of Ireland Family History Society, Larne Branch. Venue: Larne Bowling & Lawn Tennis Club, 112-120 Glenarm Road, Larne, Co Antrim BT40 1DZ. All welcome. 7:30pm. Free. Wednesday 6 December: How to draw a family tree without using up four rolls of wallpaper, with Tony Hennessy MAGI. Host and venue: Medieval Museum in Waterford's Viking Triangle, The Mall, Waterford City. All welcome. 1:15pm to 2pm. €5 admission on the door. No booking required. Wednesday 6 December: Using Early-Modern records - a workshop. Host and venue: Public Record Office of Northern Ireland, Titanic Boulevard, Belfast. 10:30am to 1pm. Free. Need to register. Thursday 7 December: Flights of Fancy, Offaly follies and their demesnes, with Rachel McKenna. Lecture and book launch. Host and venue: Offaly History Centre, Bury Quay, Tullamore, Co Offaly. Details. 8pm–10pm. All welcome. Members €2 non members €5. Saturday 9 December: The Life and times of the Archdales, with Peter Archdale. Host: NIFHS Tyrone Branch. Venue: Seminar Room, First Floor, Omagh Library, Dublin Road, Omagh, BT78 1HL. 10am to noon. All welcome. Sunday 10 December: How to get ready to search Irish records, with Kevin Cassidy. Host: Lincoln-Lancaster County Genealogical Society. Venue: Walt Branch Library, 6701 S 14th St, Lincoln, Nebraska, USA, 2pm–4pm. All welcome.